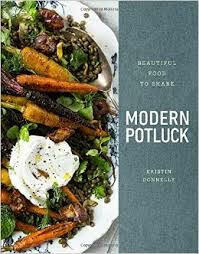 For our next cookbook book club, we’ll use Modern Potluck, by Kristen Donnelly. Modern Potluck celebrates the tradition of potlucks, or creating beautiful food to share. You can pick any recipe from her book or her web site, see http://eatbetterdrinkbetter.com/. What could be better than a web site called “Eat Better Drink Better”! You chose a recipe from the cookbook or web site. We’ll have a non-circulating copy of the book at the front desk–you can take a photo or request a photocopy of the recipe you would like to prepare. There are also several copies of this cookbook in the minuteman library system. Make your dish at home and bring it to the ACL on Sunday, June 4th 5:00 PM, ready to eat (we don’t have ability to reheat or refrigerate at the ACL).